A late-breaking Sunday edition of This Week In Vexillology- and we're sticking around central Asia, this time to take a look at the flag of another former Soviet Republic- Azerbaijan! Balanced on the frontier between Iran and Russia, it's not that surprising that Azerbaijan has changed hands a few times down the centuries as various dynasties and kingdoms rose and fell, but it wasn't until The Qajar Dynasty lost the Russo-Persian War in the early 19th Century (you know the one, right?) that the area came under the control of the Russian Empire. That last about a century or so until the Russian Empire collapsed at the tail end of World War I and the ever so brief union of Armenia, Georgia and Azerbaijan took place- the- wait for it- Transcaucasian Democratic Federative Republic. Needless to say, that didn't last long and Azerbaijan declared the Azerbaijan Democratic Republic in May of 1918. Lots of impressive milestones were set by the ADR right off the bat: it was the first parliamentary republic in the Muslim world. The first grant suffrage to women and the first to found a modern university- Baku State (Go Big Circle Thing With A Flag in the Middle! Beat the other team! *) Alas, the ADR proved to be short-lived- lasting on twenty three months before the Soviets invaded, because oil is more important that your right to democratic self-determination or independence, damn it! The Revolution waits for no one! But! 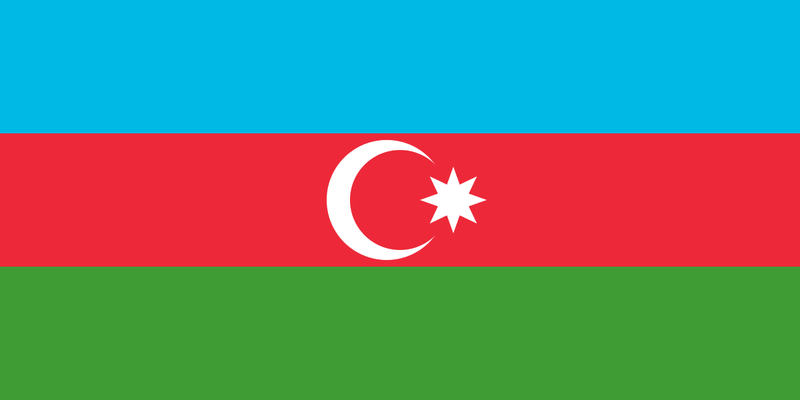 The ADR did more or less adopt the flag of modern, independent Azerbaijan- so technically, this flag was adopted on November 9th, 1918 and then re-adopted on February 5th, 1991. The crescent and the star are common symbols associated with Islam- but there's some controversy over why just an eight pointed star was used. Some people say Azerbaijan written in Arabic only has eight letters- but there's also an interpretation that says that the eight points are for the eight Turkic peoples in the area, but other people say that there are only seven unless you're counting the Kipchaks are two separate people- the Kazakhs and the Kyrgyz- but... look, the star is controversial, all right? So there it is, the flag of Azerbaijan! Remember, until next time, keep your flags flying- FREAK or otherwise! *I can't tell you how much it would have made my week to find out that Baku State had an American style mascot to go along with it's bsu.edu.az web address.